This is Jim Slater’s recipe for investing success – that if you concentrate on learning about a particular aspect of investment, you can quickly become more knowledgable about it than “the other people in the room”. You will then make better choices – and bigger profits. Mr Slater, who chose undervalued growth stocks as his specialism, called this approach “the Zulu principle” (the name of his most famous book) because he noticed how quickly his wife became, relative to most people, an expert on Zulus after reading a magazine article on the subject. “It occurred to me that if she had then borrowed all the available books on Zulus from the local library, she would have become the leading expert in the county,” he said. So when he decided to learn about the stock market after an illness that he feared might end his career as a company executive and force him to find another source of income, he researched the subject exhaustively before he bought his first share. “At the time there were two weekly investment magazines, The Stock Exchange Gazette and the Investors Chronicle,” Mr Slater said. “I bought two years’ back copies of both and read through them page by page. 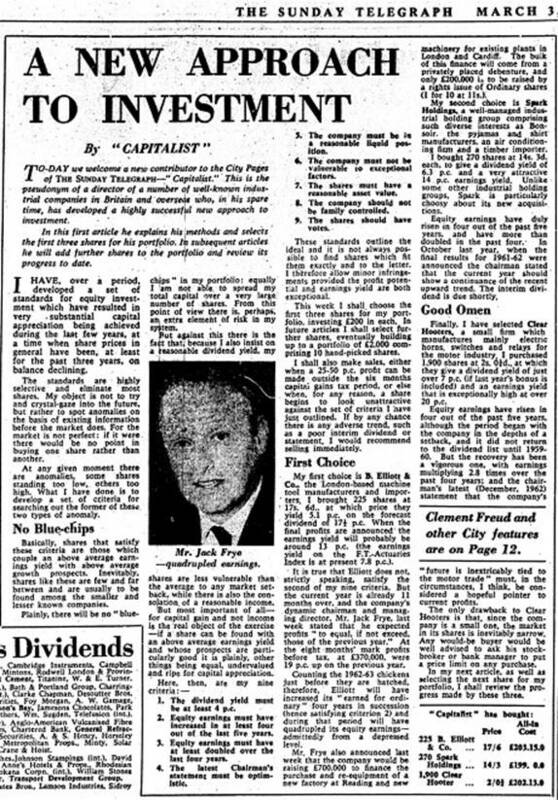 Once he had come up with his system, he put it to the test in a stock-tipping column in The Sunday Telegraph, titled “The Capitalist” (pictured), which began in 1963. In two years his tips rose by 68.9pc, against just 3.6pc for the wider market. So what was his system? First, he preferred small companies to large ones. “Mammoth companies rarely double their market capitalisation in a year. “In contrast, small companies often do this and more,” he said, summarising this analysis neatly in the phrase “elephants don’t gallop”. Then he came up with a means to determine which small companies with good growth prospects were undervalued. Most investors are familiar with the “price to earnings” or p/e ratio, which shows how much you have to pay for each £1 of profit made by a company (so a smaller figure signifies that you are buying profits cheaply). Mr Slater took it a stage further to work out when investors were buying growth cheaply. He devised the “Peg” ratio, which is the p/e figure divided by the annual growth rate of the company. For example, a share with a P/E ratio of 20 but growing at 25pc a year would have a Peg of 0.8. Investors should seek shares with a Peg of less than 1 but ideally below 0.75, Mr Slater said, combined with a p/e (on the basis of forecast profits for the current year) of less than 20. The company should also be able to show consistent growth in profits in at least four out of five years. In the first “Capitalist” article, he outlined a few other requirements. These included a dividend yield of at least 4pc; that the most recent chairman’s statement must be optimistic; that the company must not be vulnerable to exceptional factors; that it shouldn’t be family controlled; and that the shares should have votes. Mr Slater also suggested watching out for directors selling shares or large debts, while cash flow should exceed profits. Mr Slater’s system works on measurable data, so it is possible to replicate and apply it to the stock market today. This is what the boffins at stockopedia.com have done – in fact, the website’s “Jim Slater” stock screen is its most popular. It is also successful, returning 47.7pc in capital gains over the past 12 months and more than 90pc over the past two years, compared with 7pc and 23pc, respectively, for the FTSE 100. Twenty shares currently make it through the Slater screen, but we have decided to focus on four. These stocks are also held in the fund run by Mr Slater’s son, Mark – the MFM Slater Growth fund. Trifast makes and distributes industrial fastenings (such as nuts and bolts). It recently completed the acquisition of an Italian rival. A utility cost management consultancy. High energy prices are expected to stimulate demand for its services. Pressure Technologies is an engineering company that specialises in high-pressure devices. A boom in the deep-water oil and gas market could boost sales; the Slater Growth fund is a buyer. The house-builder and construction business could benefit from momentum in the property market, supported by the Government’s Help to Buy scheme and the wider economic recovery.